I recently saw a picture of a Swedish Easter Tree and I fell in love. I have been planning to make one with the girls for Easter this year. Last weekend we had a lot of snow and we were a little house bound. 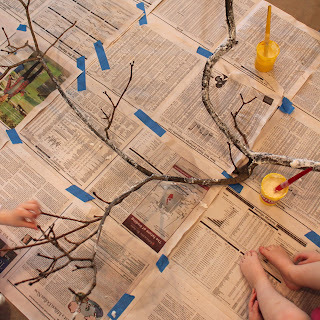 A week or so ago I had found a large branch in the garden for this project. 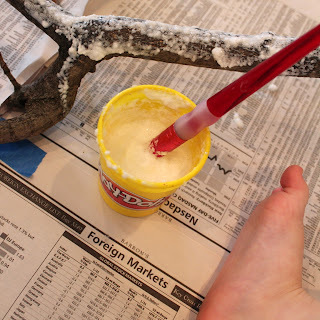 I armed the little ones with paint brushes and glitter glue (1 part Elmers Glue, 1 part water, 3 parts glitter - you can get huge pots of glitter at Michael's.) I was amazed at the attention span that the girls had for this project. They painted the tree for at least an hour - which I thought was impressive for a 2 and nearly 4 year old. My nearly 4 year old was so excited at the prospect of our Easter tree that when Daddy said we couldn't put up an Easter Tree up in February (ba-hum-bug) there were a lot of tears. I did feel for the little one - having painted the tree for an hour and then being told the tree would not be displayed until March - it did seem a little mean. 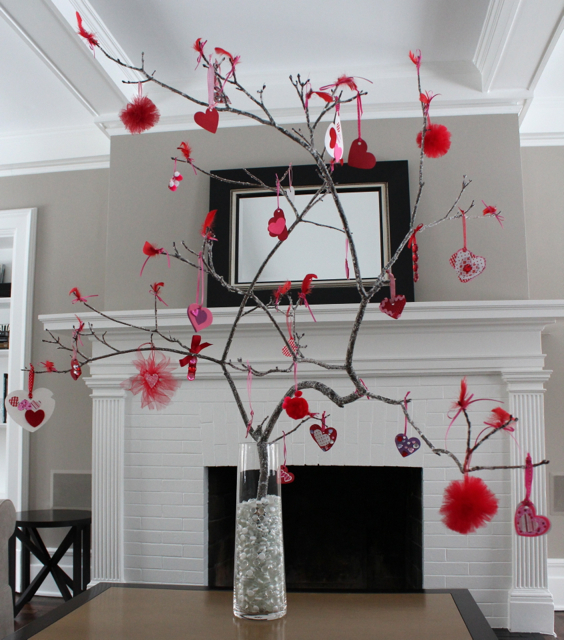 So when Daddy finally gave in and said it could be a Valentine Tree - we could make valentines and hang them on the tree - and when Valentine's Day was over we could then turn it into an Easter Tree. The little one was made happy again. 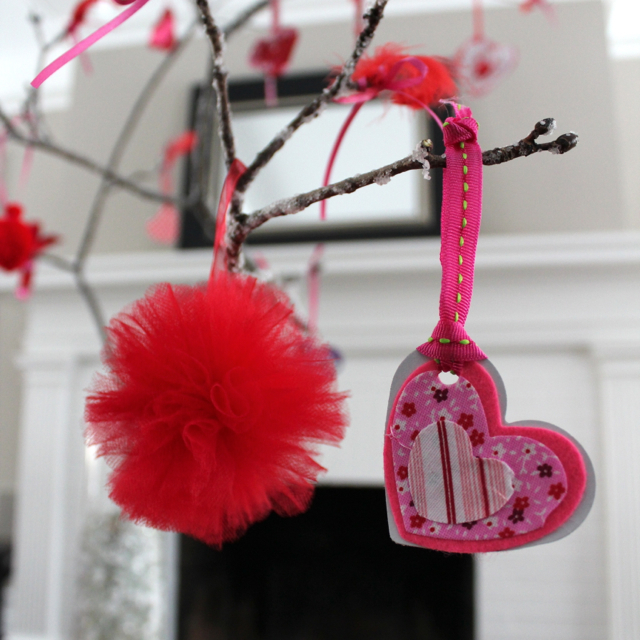 We had SO much fun (2hrs straight - with a cookie break) making valentines to hang from the tree. 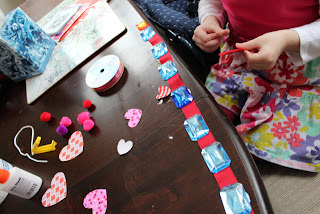 Perfect 5 minute mini projects for her - which involved a lot of glue, paper punches, scissors, gems, ribbon. She was in heaven - and I think the result looks really cute. I also made some mini tulle pom poms for her to hang too. As with a Swedish Easter Tree we added feathers - but I glued them to ribbon and then tied them to a tree with a bow. This means we will be able to quickly change them when Easter comes along! I'm usually a bit of a perfectionist when it comes to crafts - but I loved all the little trinkets my eldest made - with all their random imperfections. 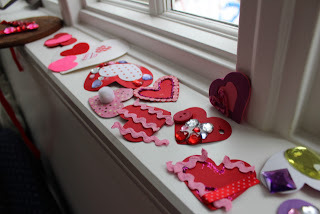 She will also be really excited to come home from school on Thursday and hang all the valentine cards she gets from class. We put our tree into a tall vase filled with glass pebble and displayed it proudly in the middle of our coffee table. 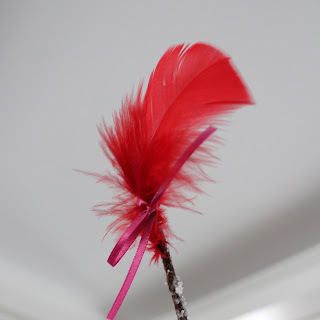 So much fun was had - and it looks so good (the photos really do not do it justice) - that I plan to make this a seasonal tree - it will be with us all year (hear that Daddy?) 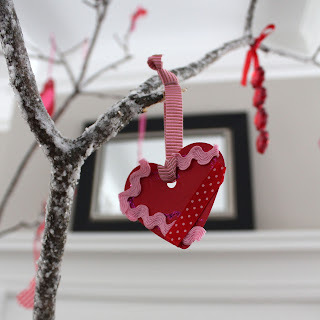 and we will do seasonal projects and hang them on our tree - Easter will be next - then Summer, Fall, Halloween, Thanksgiving, Christmas .... can we think of anymore? Daddy will be wishing he had just let us put up the Easter Tree in February. I love your holiday tree. Once when house hunting we looked at a place that had a branch like yours in a vase. Hanging from it were hand blown glass hummingbirds. I immediately bought a hummingbird, intending to get a collection and make my own tree. So far I only have two, but you may inspire me to get back on track. So there, Daddy! 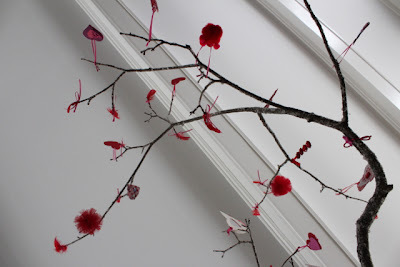 I love this idea for displaying seasonal bits!